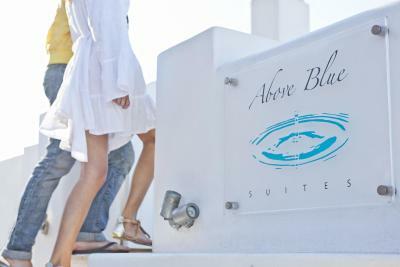 Lock in a great price for Above Blue Suites – rated 9.7 by recent guests! The entire experience at Above Blue was incredible! It definitely exceeded our expectations. Giorgos and Eleftheria were absolutely wonderful and a pleasure to get to know. They made sure we had everything we needed and that our stay was superb! They made us feel so welcome and went out of their way to make sure everything was perfect. They made recommendations for local activities and places to eat and even arranged dinner reservations for us. 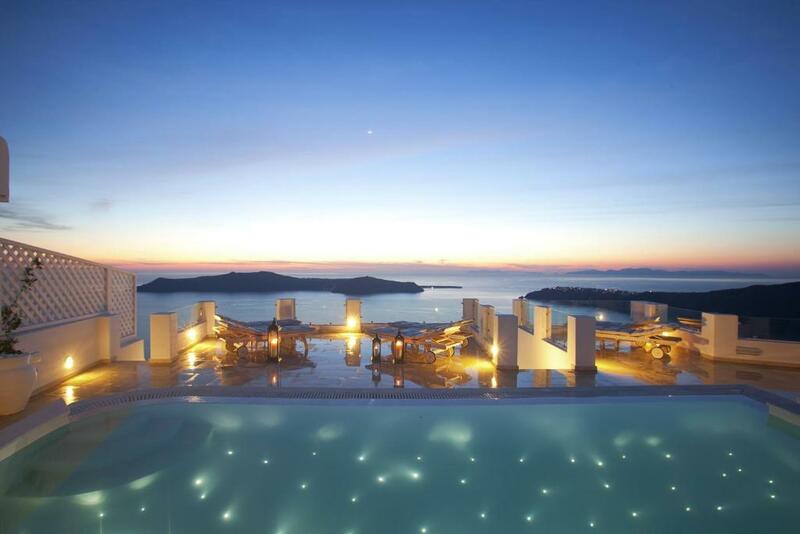 We could not be more please with our stay in the Villa at Above Blue! Above Blue was a fabulous hotel for us!! Staff were very friendly and accommodating!! They pay attention to the little details which make your holiday that much more enjoyable! The hotel is an easy walk to Fira and if you are up for a bit of a hike, you can be in Oai in 2.5 hours. Each room is beautiful and unique. We spent most evenings on our terrace enjoying the view. 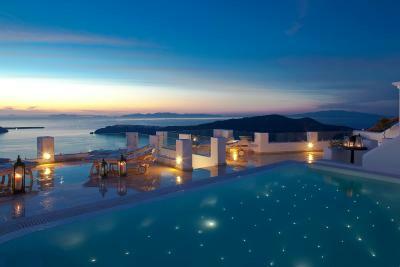 One of the most beautiful views in the world!! The view is stunning and nice place to chill and spend a day. The staff is very helpful with 24 hours reception. Room service is perfect. Breakfast and and lamb we ordered were delicious. Perfect experience. Breakfast was amazing - you choose from a long menu of what you’d like delivered and when. Great view, very clean and comfortable. Staffs are great , very helpful and friendly. Very recommended! The staff was professional and very helpful. The views were spectacular. We had a great stay and will definitely go back to this hotel. The staff was amazing and the room and view were very romantic! I truly felt pampered in every way and could not have asked for a better honeymoon experience!! I cannot say enough about the great service we received at this property. STAFF WAS AMAZING and so helpfull!!!! Room had the best view and it was so beautiful. Everything. Our stay was perfect! We were so lucky to find this place! Everyone at this hotal does everything to make you feel special. 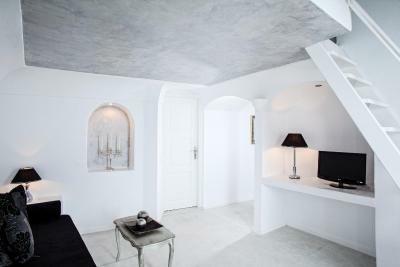 The room is cute, cozy and romantic ♡ It has everything you need and a great minibar. 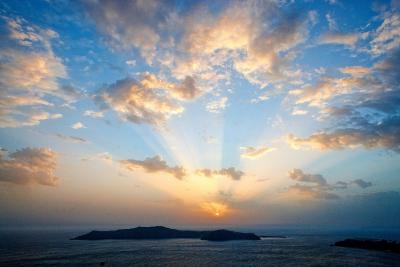 The location is wonderful to see the famouse Santorini sunset. Breakfast is fabulous. 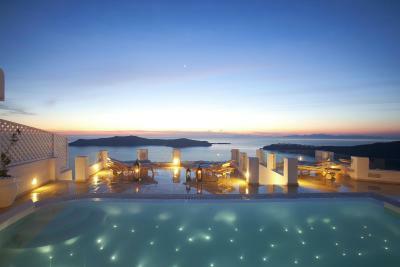 Above Blue Suites are constructed in harmony with the Cycladic architecture. 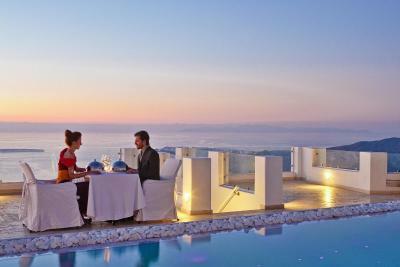 Each uniquely decorated villa or suite features a terrace with panoramic views of the sea. Champagne along with a rich breakfast is served every morning in the privacy of each suite’s terrace overlooking the sea. 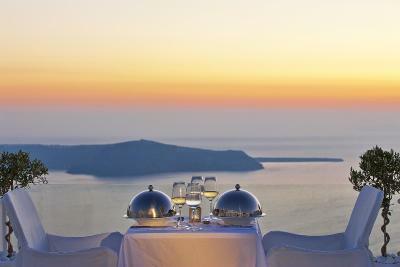 Those wishing a special dinner may be served on the suite’s private balcony. 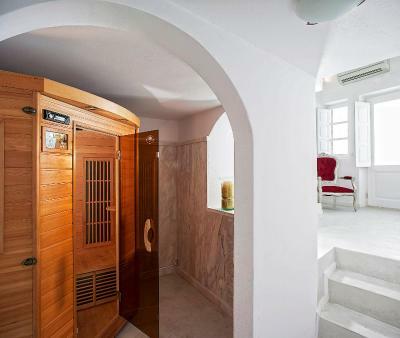 Guests can enjoy private massage sessions by the hotel’s professional masseuse, or free wireless internet access in the public areas of the complex. 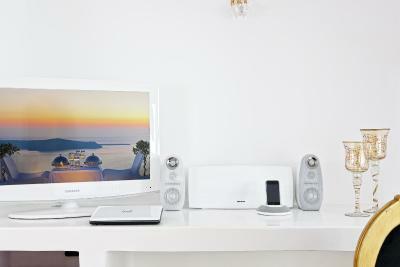 Above Blue Suites enjoy an ideal location just a short walk from the cute local taverns and shops. 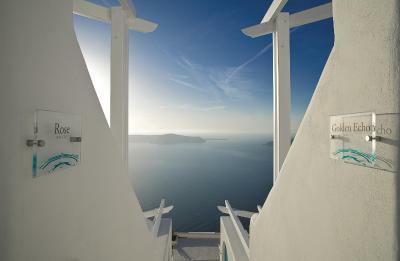 Guests can take a stroll along the pathways south to Fira. 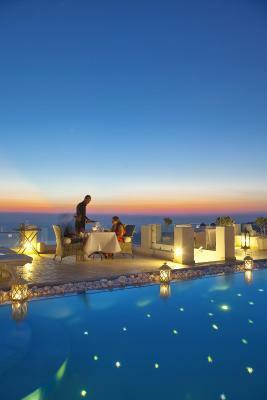 When would you like to stay at Above Blue Suites? 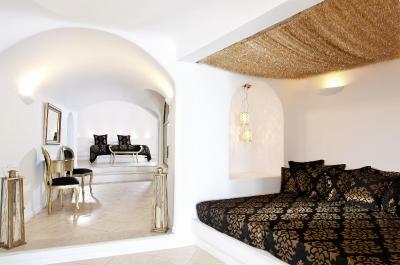 Pearl is the smallest suite, offering direct pool access and terrace. 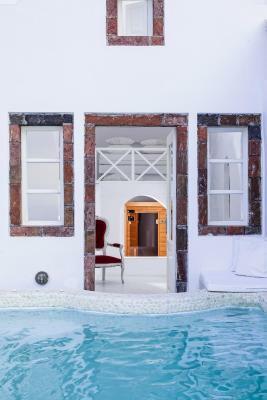 Pool access suite with terrace, in lilac and light green colors, located in front of the pool. Suite with hot tub on its private balcony. Queen bed with white linens and blue cushions. Suite with spa bathtub and terrace. 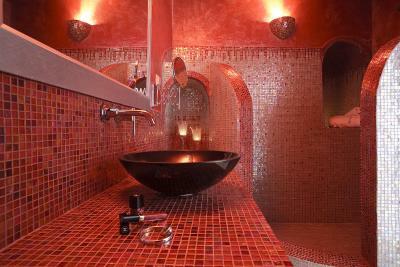 The bathroom featuring green mosaic leads to the spa bathtub. Grand suite offers a very generous space with an outdoor hot tub and a spa bathtub. Suite with outdoor hot tub in its private balcony. Red colors dominate this spacious suite. Suite with outdoor hot tub on its private balcony. Bathroom with bronze and gold-colored mosaics. 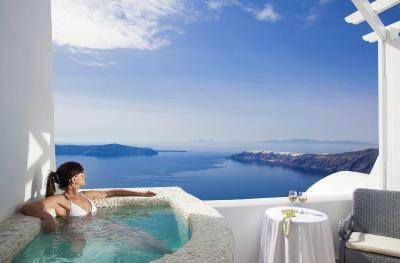 Suite with hot tub on its balcony. Designed for honeymoons, it features rose pink details. Suite with hot tub on its private balcony. Heavenly light blue and sunset color features. Suite with hot tub on its private balcony. Black and silver colors are harmonically combined. This villa has an outdoor private plunge pool with hydro-massage jets, a sauna room, and 3 sitting areas offering unbeatable views. 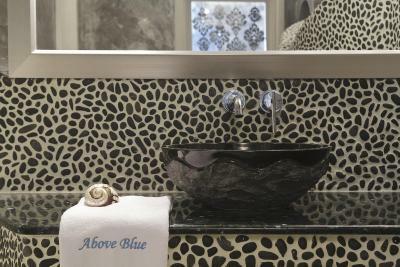 House Rules Above Blue Suites takes special requests – add in the next step! 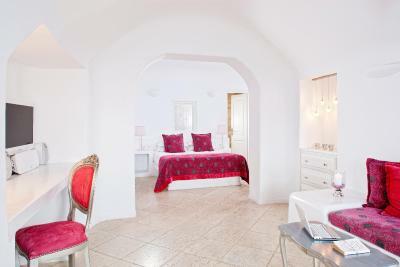 All children from 12 to 16 year are charged EUR 60 per person per night for extra beds. Above Blue Suites accepts these cards and reserves the right to temporarily hold an amount prior to arrival. Kindly note that all rooms are non-smoking. All the stairs. Lots and lots of stairs. First class in every way. Wonderful service, upgraded room, fabulous room with world class view. Very nice and hospitable staff , property was very clean , good was good , views from our room was too die for , excellent location. If there were more choises for the breakfast. The staff were very helpful, the suite was even better than the pictures, and room service was perfect. 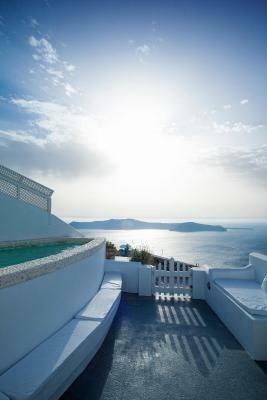 Location was excellent slightly outside the main town Fira quite location. Friendly, helpful staff and clean premise. The suit was amazing. The view from the suit was jaw dropping. The reception was very informative and comforting. The cleanliness was impeccable. The location of the hole suite is perfect.